Since I was a child, I was fond of drawing clothing designs especially gowns and it was my lifetime hobby to draw and express my feelings in them. My favorite medium is charcoal pencil because I'm fond of creating dramatic shadows. 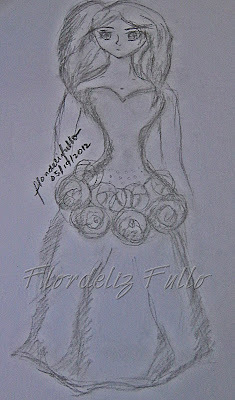 Earlier this morning, the fashion designer-wanabee in me just made use of my old charcoal pencil and sketchpad in my room and sketched some sort of a wedding dress. The design is simple and what makes its special are those cabbage roses in the waistline which represents my love for flowers.